Jenny from Crazy About Cricut here. Welcome to the first Wobble Wednesday Challenge of 2014! Thank you to all of you that Wobbled with us last year, and we can't wait to share some fun things on the Wobble Blog and Challenge this year! 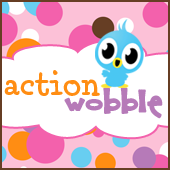 *The Royal Shoppe - Action Wobbles. *This ring file was perfect to create this fun treat for New Years! It would also be awesome for Valentine's day, or birthdays and more. *I created the sentiment on my computer. *I added the Action Wobble behind the ring to really make it pop! Lovely project - thanks for the wobble challenge - Happy New YEar!